Winner is #4 Kristin~ Congratulations! I had the pleasure of reviewing the book called "A Father's Love" written by David Goldman. A lot of you might have followed the story of David Goldman going on a 5+ year crusade to bring his son home from Brazil. This book started out as a love story from a movie and then into a nightmare. Thankfully there was a happy ending for Mr. Goldman and his son Sean. I am not a reader at all but I read the entire book in 3 days. It really captured my heart and opened my eyes to so much to things that I did not know about child abduction overseas. Mr. Goldman wrote this book in great detail and with such grace and dignity. The way he handled himself when dealing with the authorities was amazing. As much as his world was shattered he somehow managed to keep it together. I am not so sure I would have been able to handle things like he did if anyone took my child away from me. In this case it was his own wife. 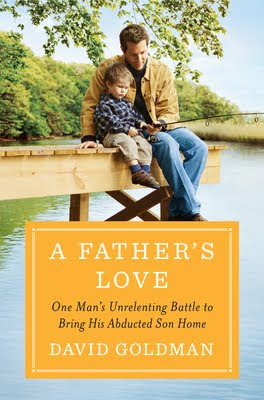 "A Father's Love" was the perfect title for this book because that is what you felt from each page you turned. If you are interested in purchasing this book you can find it here. It is available in hardcover, audio CD/audiobook or Kindle Edition. I really enjoyed reading it and I think you will too. Be sure to have a tissue box next to you just in case! I admit I did shed tears, I was really moved. I am pleased to be able to host a giveaway for one Momfiles reader to win a copy of A Father's Love. I think this would make a great Father's Day gift! To enter: Please leave a comment letting us know if you followed the David Goldman story. For additional entries you can Tweet, mention on Facebook, add the Momfiles button to your blog or follow me on Twitter and/or Facebook. Just leave a separate comment for each entry method to count. Contest is open to US Residents and will end at 9:00 PM EST on May 24, 2011. Please leave a visible email address if you do not have a Blogger Profile. Winner will be chosen via random.org and will be contacted by email. Good luck! Disclosure: I received a copy of the book for review purposes and all opinions are 100% mine as always. I remember hearing about the David Goldman story although I didn't follow it obsessively. I have the Momfiles button on my blog. I watched the story on Dateline and also read about him and his son in People magazine. I had not heard of this previously. I did follow this story and would be interested in reading this book. i did follow the story and im glad they made a book, sounds like a great read!